I have been working on Miss Lila's House for the past couple of days. I got the bottom part finished up this morning. I would love to get this one finished soon! 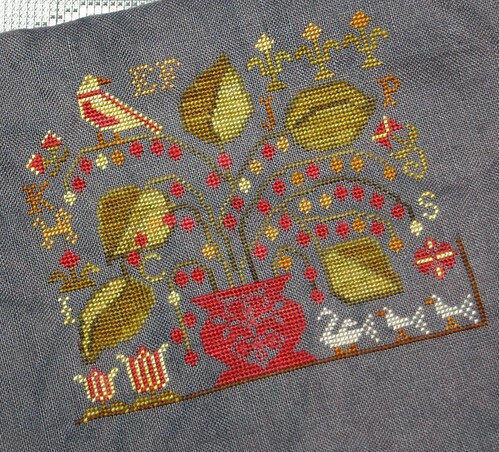 I absolutely LOVE that design and hope to stitch it one day. Have a fun weekend! I love Miss Lila's House!! Good job!! Great progress on Miss Lila. Mine isn't that far but hope to get back to her soon. Enjoy your weekend with lots of stitching time! It looks great Nicole. Hope you can get in a lot of stitching time this weekend! Nicole, those colore just "POP" on that fabric. Looks great! It's gorgeous, Nicole! Love it! Oh, aren't you a fast stitcher, Nicole. And your work is always so lovely. This beauty is no exception! i love how the colors really pop out on this piece! it looks great!! Oh, oh, oh! It's gorgeous!! Looks like you are on a role with this one!! It is turning out fabulous!!! Keep up the great job! Those colors just jump and scream, don't they?! I love it! What wonderful colors! Your stitching is SO pretty! Have a great weekend! It's looking very pretty, Nicole! LOVE IT! Love the linen! Enjoy this weekend without hubby...always nice to see them go and even better when they come back home! LOL! This piece is turning out great!!!! Love your fabric and thread choices!!!! Gorgeous design, colours and fabric. Fantastic colours! I love it! I love this project. 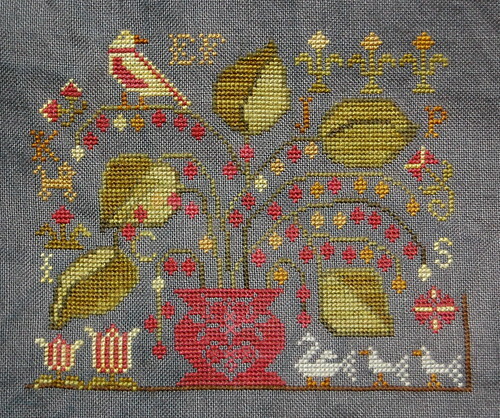 What a great colour harmony there is between the threads and the fabric colour. This is just turning out to be really beautiful Nicole! You have made such good progress on it too! I love watching your progress on things here!! Gorgeous! Looking great, love the colors ! I truly love how these colors just pop out on this fabric. Just a wonderful choice. I am loving this piece! MLH is so gorgeous! I love the fabric you are stitching her on, especially.